comprises a night of Brahma, in which the creator of the universe goes to sleep." "The time concept of modern archeology, and modern anthropology in general, resembles the general cosmological-historical time concept of Europe's Judeo-Christian culture. Differing from the cyclical cosmological-historical time concepts of the early Greeks in Europe, and the Indians and others in Asia, the Judeo-Christian cosmological-historical time concept is linear and progressive. "Hindu historical literatures, particularly the Puranas and Itihasas, place human existence in the context of repeating time cycles called yugas and kalpas, lasting hundreds of millions of years. During this entire time, according to the Puranic accounts, humans coexisted with creatures in some ways resembling the earlier toolmaking hominids of modern evolutionary accounts." "Each yuga cycle is composed of 4 yugas. The first, the Satya-yuga, lasts 4800 years of the demigods. The second, the Treta-yuga, lasts 3600 years of the demigods. The third, the Dvapara-yuga, lasts 2400 years of the demigods. And the fourth, Kali-yuga, lasts 1200 years of the demigods . Since the demigod year is equivalent to 360 earth years, the lengths of the yugas in earth years are, acording to standard Vaishnava commentaries, 432,000 years for the Kali-yuga, 864,000 years for the Dvapara-yuga, 1,296,000 years for the Treta-yuga, and 1,728,000 years for the Satya-yuga. "This gives a total of 4,320,000 years for the entire yuga cycle. One thousand of such cycles, lasting 4,320,000 years, comprises one day of Brahma, the demigod who governs this universe. A day of Brahma is also called a kalpa. Each of Brahma's nights lasts a similar period of time. Life is only manifest on earth during the day of Brahma. 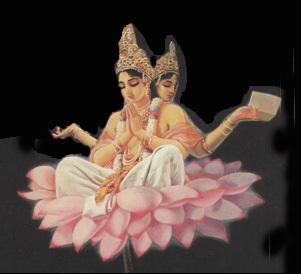 With the onset of Brahma's night, the entire universe is devastated and plunged into darkness. When another day of Brahma begins, life again becomes manifest. 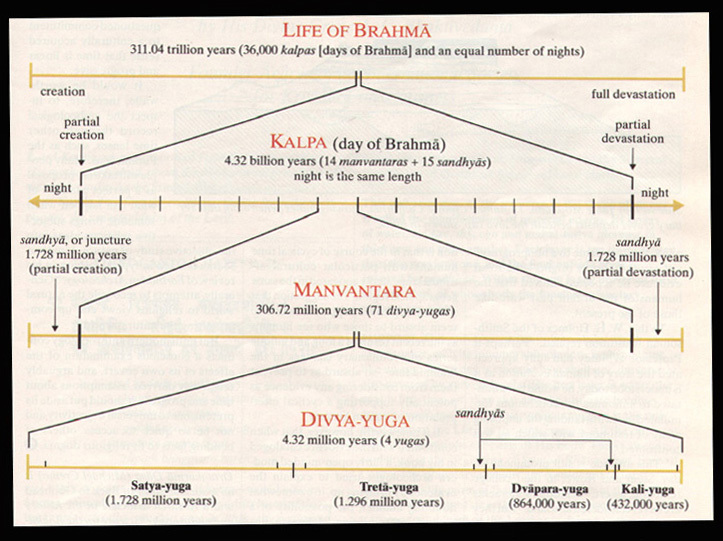 "Each day of Brahma is divided into 14 manvantara periods, each one lasting 71 yuga cycles. Preceding the first and following each manvantara period is a juncture (sandhya) the length of a Satya-yuga (1,728,000 years). Typically, each manvantara period ends with a partial devastation. According to Puranic accounts, we are now in the twenty-eighth yuga cycle of the seventh manvantara period of the present day of Brahma." "This would give the inhabited earth an age of about 2 billion years. Interestingly enough, the oldest undisputed organisms recognized by paleontologists - algae fossils like those from the Gunflint formation in Canada - are just about that old. ** Altogether, 453 yuga cycles have elapsed since this day of Brahma began. Each yuga cycle involves a progression from a golden age of peace and spiritual progress to a final age of violence and spiritual degradation." Swami Prabhupada (1973), Los Angeles: Bhaktivedanta Book Trust. **Stewart, Wilson N. (1983) Paleobotany and the Evolution of Plants. Cambridge, Cambridge University Press.